Snaking its way through the film is Ry Cooder's achingly sad slide guitar score - a series of compositions based around 'Dark Was The Night' by Blind Willie Johnson. (Cooder contributed the same track to Performance; Wenders built his own blues doc The Soul Of A Man too.) 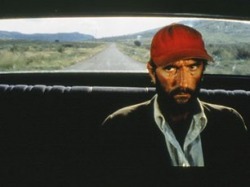 As has often been the case in Wenders' films, the landscape and the road are supporting players, but Cooder's soundtrack is the production's star, those eerie bent notes drifting away from the scale as Travis himself drifts away from the map.